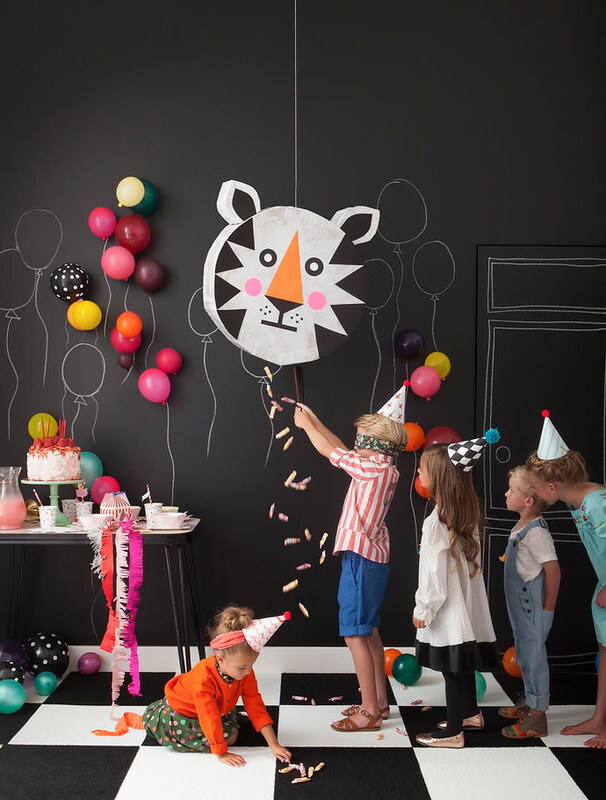 Check out this terrific tiger piñata designed by Merrilee Liddiard (MerMag) for her new book, Playful: Fun Projects To Make With + For Kids! How does the song go? “Wild thing, you make my heart sing”? 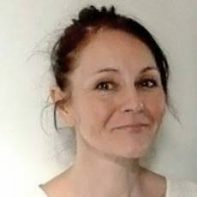 Well, after a week of deadly wild weather here in the South of France, I’m not so sure about that, hum… Life in the virtual world has been a lot tamer, thank goodness, although teeming with exciting new wild animal designs for our little ones. Seat belts fastened and binoculars at the ready! 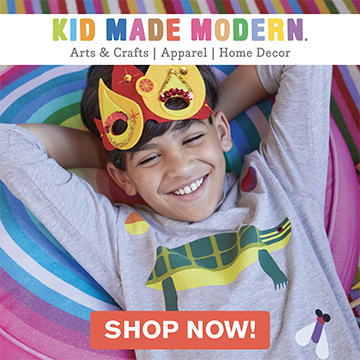 I’m going to take you on a quick safari tour of some new-to-me animal products in the kids’ design world. Enjoy the ride! As mentioned above, if you are into paper crafts, toys, dress-up, art, and repurposing, Merrilee Liddiard’s brand new, much-awaited, book, Playful looks choc-full of simple, easy-to-follow DIYs. 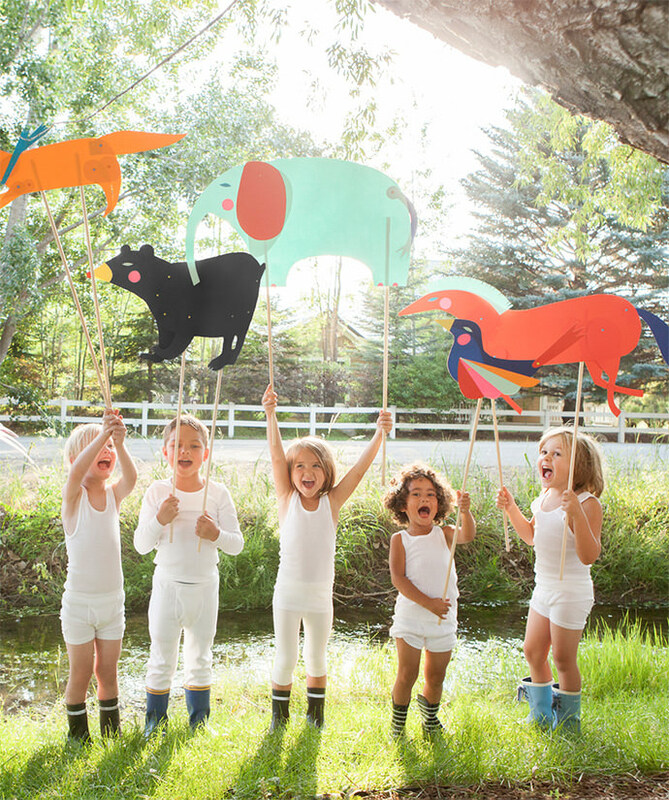 I haven’t seen one project that I don’t like yet, but wow, these animal paper puppets are wonderful! 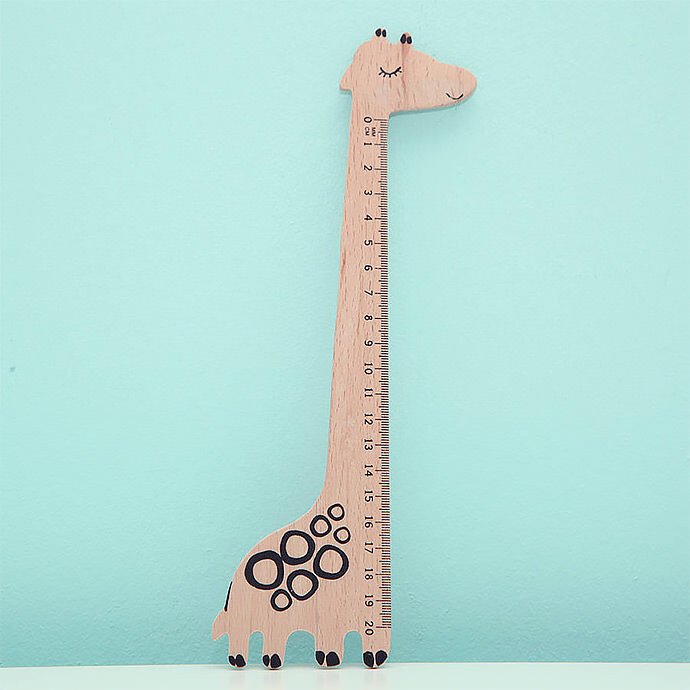 I spotted this wooden giraffe ruler from Red Berry Apple too late for my youngest son’s back-to-school list but what a super fun gift this wooden giraffe ruler would make at Christmas! There, I said it, I’m thinking of stocking stuffers already. 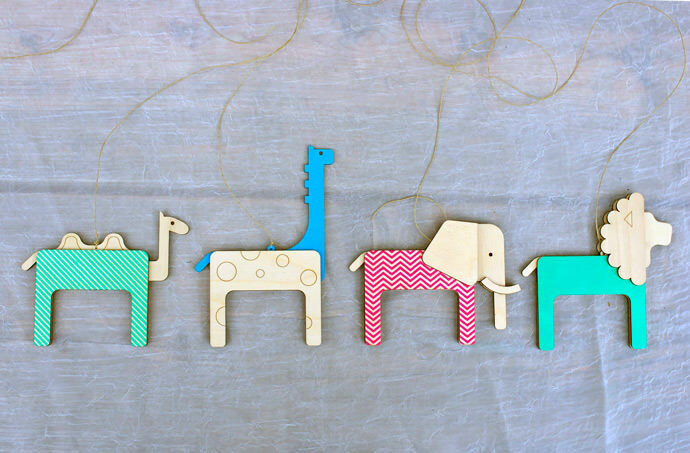 Etsy seller Miloshka’s laser-cut animals caught my attention the other day, like this Safari Wood Crib Mobile, and I’m really looking forward to seeing more. If you like modern, graphic mobiles and decorative items, Kira Varvanina’s colorful wooden designs have been tried and tested on her 11-month-old daughter and are all handmade with love. 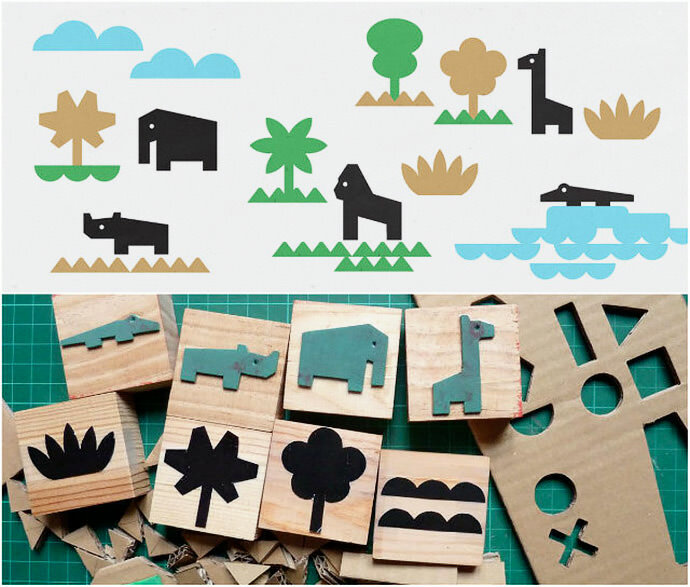 Keep your eyes peeled for Heroine Paper Goods’ soon-to-launch Jungle Stamp Set for crafty folk of all ages. I’m a big fan of Susi Martinez’s bold graphic designs and illustration work, and her stamps are always so beautifully packaged. Another great gift set for the end of the year! 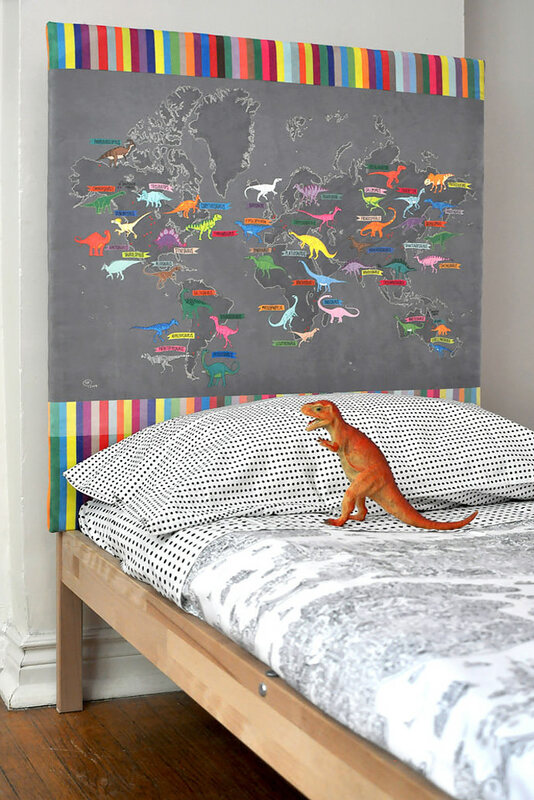 Although not quite what you might expect on a safari tour, I couldn’t resist sharing this fabulous DIY Dino Map Headboard by Samarra Khaja. I’m getting carried away here, but hey, my dino-loving kids would go wild about this. Love! safari wood cribs are super nice! I love you so much! XO Have a great Sunday!